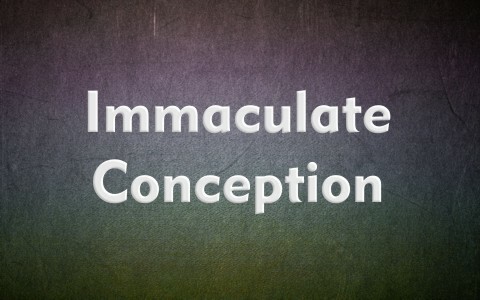 Most of us have heard about the Immaculate Conception, but do we really know why it’s called that? When we use the word “immaculate” we often use it to refer to something that is perfect or spotless, or without stain, so the word is used for something that has no blemish and no imperfections. It’s difficult to find anything in this world that’s perfect. In fact, I can’t find anything that I can actually call “immaculate,” so the use of this word, in my opinion, should be reserved only for those things or thing that has no imperfections. The very same word can be used for God because we know that the Apostle Peter said that we were ransomed by God, however “the ransom he paid was not mere gold or silver” (1st Pet 1:18b), “but with the precious blood of Christ, like that of a lamb without blemish or spot” (1st Pet 1:19). You can rightly state that Jesus as a Person is immaculate and without blemish, fault, or sin because He is God and God is altogether holy and above His creation…He is totally “other” in the sense that nothing or no one is like God, so God is immaculate in every way. Jesus Christ alone was immaculate and without sin. I don’t have to look very hard to find something, or really, someone that’s not perfect. I can start in the mirror and see imperfection galore. It’s abundantly clear in Scripture that none of us are really good at all. The Apostle Paul, in speaking of humanity, says “None is righteous, no, not one” (Rom 3:10), and “no one understands; no one seeks for God” (Rom 3:11), and that most certainly includes me and you. Scripture tells us that “All have turned aside; together they have become worthless; no one does good, not even one” (Rom 3:12). For the majority of the world, “There is no fear of God before their eyes” (Rom 3:18), even though “all have sinned and fall short of the glory of God” (Rom 3:23). I would say we’ve fallen short of God’s glory infinitely. It’s not even close. We are so far from God and His holiness that we need help in even being able to come near Him. That’s because my and “your iniquities have made a separation between you and your God, and your sins have hidden his face from you so that he does not hear” (Isaiah 659:2). What we need is a Mediator and He Who is our Mediator is Jesus Christ. The only way to perfection is through the Perfect God-Man, Jesus Christ. Paul tells us that it was “For our sake he made him to be sin who knew no sin, so that in him we might become the righteousness of God” (2nd Cor 5:21). This doesn’t mean we’re immaculate before God, but that God imputes Jesus’ own righteousness on our behalf so when God sees us, He doesn’t see the sinful creatures anymore; He only sees Jesus’ own righteousness, and that’s reason to give Him praise, honor, glory, and worship. Official Catholic doctrine says of Mary, the mother of Jesus, that “The blessed Virgin Mary to have been, from the first instant of her conception, by a singular grace and privilege of Almighty God, in view of the merits of Christ Jesus the Savior of Mankind, preserved free from all stain of original sin,” so they believe that Mary was protected from original sin and did not have the sin nature that mankind has been cursed with and have been born into (Psalm 51:5). Rather, Catholics believe that Mary not only didn’t have a sinful nature, but she herself was sinless, however, this contradicts Scripture which says all have sinned; all have fallen short of God’s glory; and there is none that do good. It’s only because God is good that we can be seen as having Jesus’ own righteousness, and it has nothing to do with Mary. Even though Mary carried the Author of the New Covenant within her, she was just a woman in the sense that she too needed a Savior. Even so, some believe that Mary must be as equally sinless as her Offspring, Jesus Christ, but this is not what the Bible teaches. Rather, some believe that Mary had a superabundance of grace, rendering her sinless, and that’s why God chose her to bear His Son, but again, that’s not what Scripture teaches at all. For one thing, she and Joseph had other children, so she obviously didn’t remain a virgin, although she was certainly a virgin when she conceived by the Holy Spirit. Clearly her Seed, Jesus Christ, was sinless, so the fruit of her womb was the only perfect human ever born. Yes, Adam and Eve were perfect, but only for a time, and only until they disobeyed God and took from the Tree of the Knowledge of Good and Evil. We can start with ourselves and know “there is not a righteous man on earth who does good and never sins” (Eccl 7:20), and this most certainly includes Mary, the mother of Jesus. The immaculate conception is not taught in the Bible, nor does it ever say any one of us are immaculate, but rather Jesus was miraculously conceived inside Mary, who was a virgin at the time. Even Mary rejoiced at the news of Jesus’ coming birth through her but she still declared, “my spirit rejoices in God my Savior” (Luke 1:27), so here is Mary saying that God is her Savior, referring to Jesus Christ. If Mary had been sinless, she wouldn’t need a Savior, however, Mary, like the rest of us, needs a Savior, because like her, not one of us is without sin. It’s not humanly possible, even for Mary, to not sin. She needed the Savior just as much as we do. The Immaculate Conception refers to the condition that the Virgin Mary was free from original sin from the very moment of her conception in the womb of her mother, but this cannot be true. Either this is right and the Bible is wrong, or Mary was a sinner like the rest of us which means she too needed a Savior. She said as much (Luke 1:27), so now that you know more about the Immaculate Conception, I hope you can understand what it means, but the way to being seen as being immaculate comes only through God’s bringing us to repentance and then putting our trust in Christ. There is no other way to be seen as being righteous than through the life, death, and resurrection of Jesus Christ Who alone was immaculate and without sin. All others, like you and me, fall infinitely short of God’s glory, so welcome to the club. Mary the mother of Christ is a saint now and she became the mother of all nations. Hello Loriss and thank you for your comment. The Bible never says Mary is the mother of all nations. God is the Creator of all nations and Father to those who are His children, but we must stick to Scripture, and yes, Mary was blessed, but not blessed like Christ was. Yes, Mary is a saint, but so are all who believe in Jesus Christ. Full of Grace is how the Angel Gabriel addressed Mother Mary, why is the question? Did anyone else got so much grace, so much favour from the Lord? I would say no. So of all humans she was choosen as the greatest by God”s grace if we regard Jesus as God himself. Yes, Mary was full of grace but it was not her grace but God’s grace because Mary was a sinner like the rest of us. She needed the Savior as much as a man in prison did. Next post: Who Were The Herodian’s?